Because what else could I possibly make with two large balls of perfectly coordinated cotton yarn? My Mom bought this yarn for a project that she ended up abandoning in a fit of frustration. Not knowing what else to make with the yarn, she passed it on to me. She was happy to be rid of it from her stash, and I was happy to take it because I knew it would make a great blanket for Bridget's room. I love the color changes in the variegated yarn. The variegated yarn is called In Motion - an interesting name for yarn - and the pink is Mod Pink. Both are Bernat Handicrafter Cotton. The pattern is from Lion Brand - a simple v-stitch pattern (click here for the pattern). 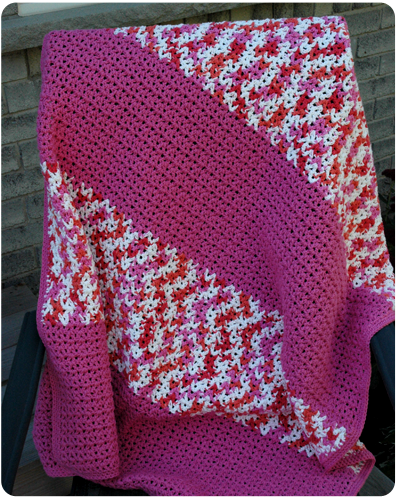 I have made several blankets using this pattern including Claire's Pink and White Blanket. I actually started this blanket while we were driving to Hilton Head Island in August. It was the perfect travel project...back and forth, no counting, nothing to keep track of.....perfect for viewing the scenery along the drive while still keeping my hands crafting. When the blanket was all finished, I laid it across the foot of Bridget’s bed. There is something so cozy about a blanket on the end of a bed, it says home and comfort to me. Bridget loves it. She says it is perfect for keeping her toes warm at night. That blanket looks fantastic on that bed! great color combo. And it looks so warm and cozy on this brisk Fall day. visiting via LOBS link up . Thank you Barb. I am so happy with how it turned out. It is getting really cold here, and my daughter is so happy to have a blanket to cuddle up in. 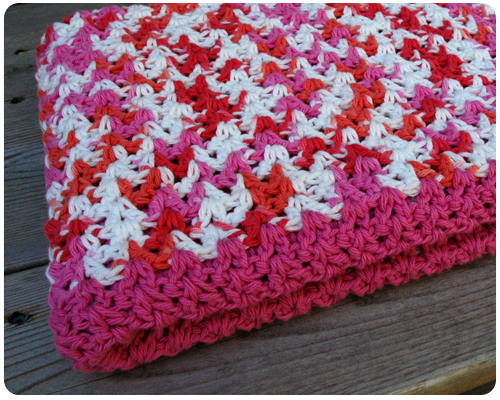 Hi Rachel, I love crocheting blankets using a well known pattern that I don't have to count stitches or pay close attention to. It is so relaxing and productive at the same time. I have a few blankets on my to do list for Christmas. How about you? I completely agree - a simple blanket pattern allows me to be productive with my hands while still allowing me to have a conversation, watch a movie, be in the noisy playroom...it is the best. I don't have any blankets planned for Christmas, but wish you the best with yours. Thanks so much for reading and for taking the time to comment. It's projects like these that make me wish I was better at Crocheting. Love the blanket, and I looks great in you daughters room. What a great thing to be able to cuddle up in when it's chilly out. Thank you Ricki. My daughter loves to cuddle up and read books so this blanket (along with the many others I have made) is perfect for her. Thanks for reading. Very beautiful!! The colors are lovely! The blanket really does look warm and cozy! It is beautiful on the bed with that quilt. I am currently working on a crocheted baby blanket. I am always so anxious to finish because I want to see the final result! Thank you Karen. I am very happy with how this blanket works with the quilt on my daughter's bed. 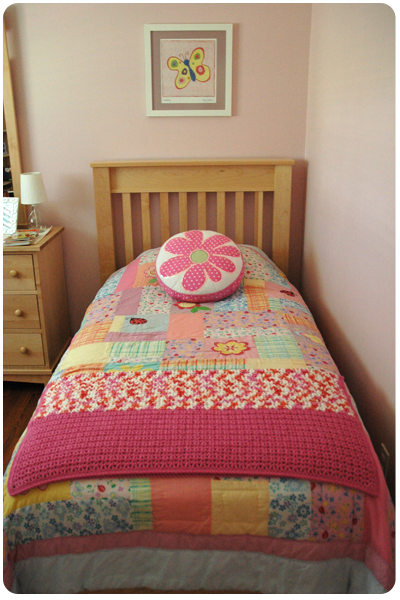 Have fun crocheting your baby blanket and enjoy that moment when it is all finished and you can sit back and admire it.